The Food Network's Bobby Flay inspired me to create a burger that combined the flavors of tuna, chipotle and pineapple from his similar burger in his new cookbook, Bobby Flay's Burgers Fries and Shakes . However, my recipe differs from Bobby's with respect to several of the key ingredients and the way that I prepare my sauce. He certainly was my inspiration in creating this healthier take on the burger. The original recipe that I started with can be found here. Cut up the tuna into small pieces and pulse until pureed in your Cuisinart. Then mix in the other ingredients and form into four burgers. Cook the burgers using a grill pan (or a regular grill, if you are somewhere other than Brooklyn in the dead of winter) for about 8 minutes, total over medium heat, being careful not to burn the burgers. To prepare my version of the pineapple mustard sauce, which I turned into a honey mustard sauce, mix 4 T of Dijon mustard with 4 T of pineapple juice and 2 T of honey. Top with fresh pineapple before serving on a lightly toasted bun. Apparently I didn't get the memo that burgers are supposed to be fattening and unhealthy. This one made me feel as good as it tasted. Finally, I wanted to include an unrelated note about a pretty cool organic vegetable I discovered today at my local organic market here in Park Slope . . . purple cauliflower (which I had heard about but had never seen). I am going to have to do something fun with it this week, but wanted to include a picture of it here first, in all its purple beauty. 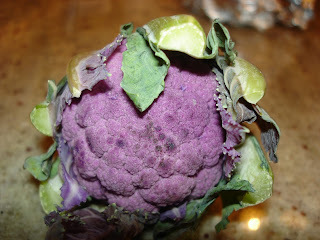 This begs the question - did nature really create cauliflower this purple? The answer is absolutely, this is not created wtih food coloring. Rather, the presence of the antioxidant anthocyanin (also found in red wine and red cabbage) gives it this beautiful color. There is currently being research done, according to the Wikipedia page linked to above, that may support some use for anthocyanins with respect to cancer and apoptosis (programmed cell death). I have some exciting recipes planned to prepare and write about in the next two weeks, including a crab couscous, turkish meatballs, scrabble tile cookies, some beer and food pairing, bread puddings and two new surprise cupcake recipes. 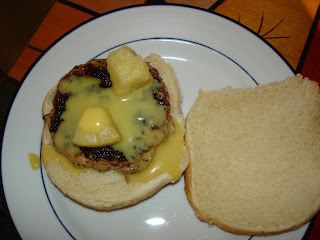 The pineapple mustard sauce sounds fantastic with the tuna burger! Thanks, it really was a great food combination. I used to make tuna burgers all the time, but they never looked as good as those! I came over becaues of your purple cauliflower, I love it! We get it here quite frequently though the white and lime green caulis are more usual. Great looking burgers, and the matching with pineapple is so inventive and intriguing - you'd never get anything so surprsing here in Italy, even though in some regions there is a sweet/sour tradition.